This portfolio of microfluidic technologies improves cell culture techniques. Current cell culture techniques have several limitations: they are resource and process intensive, the culture environment is inconsistent, and manual manipulation is both time consuming and error prone. These microfluidic inventions enable more consistent cell culture environments; allow use of high throughput devices which provide speed and consistency; conserve cell-cell factors to maintain cell-cell communication; and ultimately reduce operator error. This invention consists of microchannels to incubate oocytes and embryos. Microchannels are aligned to match the multi-head pipettor of a fluid handling robot with the dispenser of flow cytometers. After a certain amount of incubation time, depending on species, sorted sperm are introduced into the microchannels using a flow cytometer. The microchannels direct the movement and location of the sperm toward the oocyte. Once fertilized, embryos are removed from the fluid handling root and are ready for downstream steps. This process is very low shear, can be easily scaled for high throughput and should improve the yield of current processes. Most chemotaxis devices cannot be used in high throughput studies. The geometry and surface tension properties of this invention use fluidic resistance to provide convection and a flow barrier, which then enable the development of concentration gradients. Fluidic resistance ensures this gradient is not disturbed, preserving cell-cell factors. The chamber has a cell inlet, a chemoattractant is introduced in the source channel, and a blank medium is introduced in the sink channel. To facilitate culture microenvironments for embryos similar to in-vivo, this invention provides a ready-to-use culture system made using soft lithography technology. This invention has two versions: channel-less and channeled. The channel-less version is composed of wells of a size especially tailored for the characteristic size of the particular species of oocyte/embryo being cultured. This allows for a flexible platform that will accommodate a wide variety of animal species. The channeled version has microchannels networked between the wells of the channel-less version, so that cell-cell communication between oocytes/embryos can be maintained during medium change. This invention is particularly useful for culturing zona pellucida-free oocytes and embryos as the well holds the cells together much as the zona pellicuda would with intact oocytes or embryos. This invention is easily scalable and fits into standard culture dishes. Microchannels provide good micro-environments for cell/embryo/oocyte culture and chemical analysis. However microchannels are very inconvenient for loading or accessing samples. This invention uses passive pumping to change mediums or reagents. This invention does not use any connecting channels or tubing, thus eliminating waste. It can be easily expanded for high-throuhput. The figure shows the liquid flowing from small drop to large drop by surface energy forces. Fragile X syndrome (FX) is the most common form of inherited intellectual disability and occurs in roughly 1:3,600 males and 1:8,000 females. Physical features associated with FX include increased dendritic spine density, long faces, large testicles, and connective tissue problems such as flat feet, double-jointed fingers and hyper-flexible joints. Behavioral characteristics can include ADD, autism and social anxiety. While there is no single treatment for FX, there are palliative treatments that are aimed at improving the lives of affected individuals as opposed to treating the underlying condition. There are various clinics testing new medications, but no FDA-approved drug is currently available specifically for treating FX. common in FX affected individuals and has direct relevance to the underlying mechanisms of these abnormalities as well as a potential treatment of the syndrome. Bevacizumab, a drug used to block new blood vessel formation. After 10 days, FX mice treated with the drug exhibited significant reductions in testicle weight and a decrease in synapse density, which strongly suggests elevated VEGF-A expression is a major contributor for some FX abnormalities. Due to the effect of Bevacizumab on FX synapse abnormalities, the Galvez Lab also examined effects on cognitive functions via a novel vs. familiar object preferential test. The findings demonstrate that VEGF-A contributes not only to physical abnormalities of FX but to associated cognitive abnormalities as well. Further studies are being done to better understand FX and to treat the condition itself. Dr. John Katzenellenbogen from the University of Illinois has designed Pathway preferential estrogens (PaPEs) that are novel synthetic compounds that structurally resemble the natural estrogen but with its reduced binding affinity, form ER-PaPE complex with a short lifetime of seconds. This short binding is sufficient to selectively activate the ER non-genomic pathway and not the ER genomic pathway. PaPEs are shown in animal models to promote health of metabolic tissues and vasculature; reduces body weight gain and fat accumulation after ovariectomy and accelerates repair of endothelial damage; no stimulation on breast and endometrial cancerous cells. Drs. John and Benita Katzenellenbogen have developed a novel class of anti-estrogen compounds with the potential to act as breast cancer therapeutics. These compounds show potent anti proliferation effects and downregulation of estrogen receptor α. Importantly, these compounds have enhanced bioavailability compared with currently prescribed therapeutics and due to their potency can be administered at lower doses, which minimizes deleterious side effects. Intriguingly, these compounds also show strong binding to various ERα mutants which are common in breast cancer patients. Triple Negative Breast Cancer (TNBC) constitutes about 10-20% of all diagnosed breast cancers and is known to be more aggressive and difficult to treat. TNBC lacks the three most common types of receptors: estrogen receptor (ER), progesterone receptor (PR) and HER2 receptor. There is a great need to find therapies targeted against TNBC due to the challenge it presents. 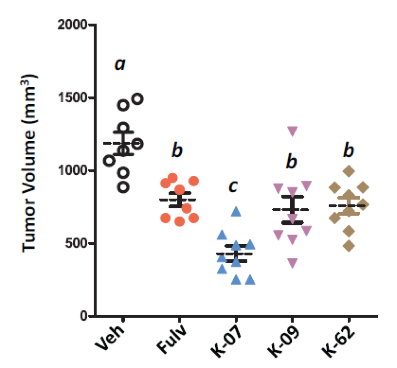 The transcription factor, FOXM1, is implicated in several types of cancers including breast – its inhibition affects many important downstream targets essential in cancer. However, there are no effective compounds with in vivo activity against FOXM1. A group of investigators from the University of Illinois at Urbana-Champaign, led by Dr. John Katzenellenbogen, have developed novel FOXM1 inhibitors that have shown activity against cancer and may be a potential therapeutic for TNBC. They first developed a fluorescent probe for screening FOXM1 inhibitors and, furthermore, synthesized novel compounds that have demonstrated good bioavailability both orally and subcutaneously. Studies in mice have shown suppression of breast tumor growth and inhibition of Tamoxifen-resistant breast cancer cell proliferation. Many estrogen receptor α (ERα)-positive breast cancers often develop resistance to endocrine therapy due to mutations in ERs. These mutations are associated with shorter patient survival and, therefore, there is a need for novel anti-estrogen therapy against these mutant ERs. A team of scientists from the University of Illinois at Urbana-Champaign, led by Dr. John Katzenellenbogen, have developed a novel class of anti-estrogen compounds with the potential to act as breast cancer therapeutics. They have shown that the novel compounds have potent anti-proliferation effects and result in downregulation of ERα. Importantly, these compounds demonstrate enhanced bioavailability and oral potency as compared to currently prescribed therapeutics. These novel compounds, due to their potency, have the potential for low-dose administration, which minimizes deleterious side effects. Studies in female mouse models have shown suppressed tumor volumes, reduced breast cancer metastases and prolonged survival.